You've likely stumbled upon these terms in your shopping search over the past few seasons—culottes, gauchos, and palazzo pants. And when you see them, you might wonder how they differ because they have a very similar design. They're wide-leg trousers that come in all different colors and fabrics, so why are there three different names for them? Though often the terms are used interchangeably, there's actually a subtle difference between the two styles. Below, we break down the culottes versus gaucho pants debate as well as how palazzo pants fit into this confusion, too. Culottes, derived from the French word "culot," which means the lower half of a thing, are knee-length trousers that are cut to very closely resemble a skirt. When this pant style first came about in the '20s, it was referred to as a "split skirt." Look for trousers that land at or slightly below the knee and have a very full bottom—those are culottes. 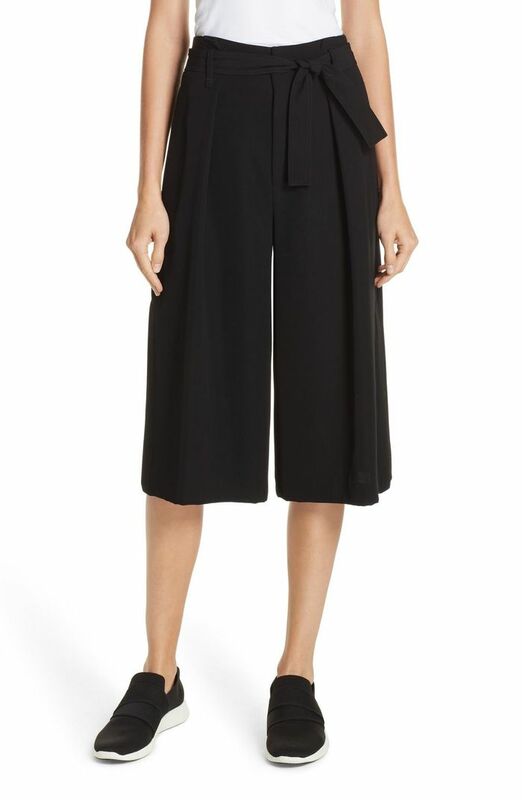 Though the terms culottes and gauchos are often used interchangeably, and to be honest, they are nearly identical in design, the main difference between the two is that gauchos are really more of a cropped pants and don't have quite the fullness of culottes. Thus, they look less like a skirt and more like, well, wide-leg pants. Yep, there's one more pants term to cover when it comes to skirt-like bottoms. Palazzo pants are, again, very similar to the other two styles, in that they have a wide-leg silhouette. The main difference? Palazzo pants are long, unlike the knee-length culottes and mid-calf gauchos. Next up, how to wear wide-leg jeans to work this season.